In my continued partnership with Hidden Valley® I'm glad to bring you another ranch-inspired recipe. 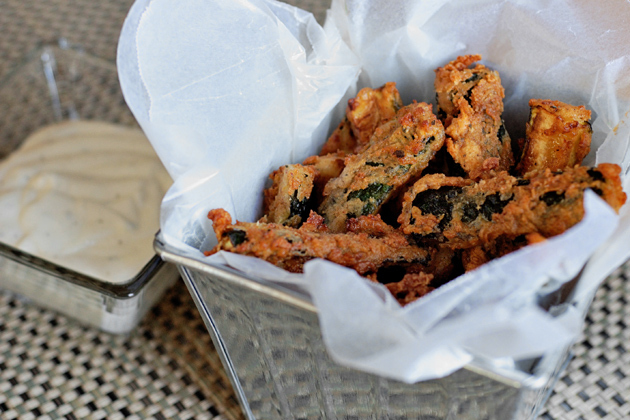 Ranch is made for vegetables, and my twist on fried zucchini would be very welcome on your game day table, or even alongside a burger as a tasty alternative to traditional fries. What's great about these is that they have a light and very crunchy crust, but there's no messy three-step breading process involved. Instead, the dry ranch dressing mix acts as a marinade while it coaxes water out of the zucchini, which then becomes the liquid for the batter. I then toss them in some spicy chipotle-seasoned flour before they take a short deep-fried dip. I think you'll really enjoy the tasty simplicity of these zucchini fries. 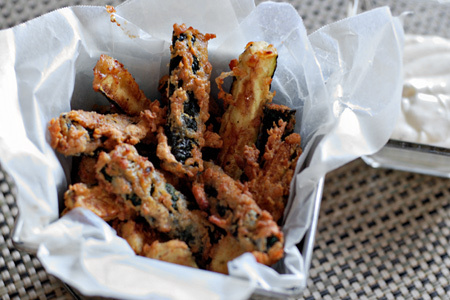 Cut the zucchini in half then slice each half into thick French-fry-size sticks, about 1/3" thick. Lay the pieces in a single layer in a shallow casserole dish (9" x 13"). Sprinkle the dressing mix evenly over the zucchini and stir the pieces to evenly coat them. Cover with plastic wrap and let sit 45 minutes at room temperature, stirring occasionally. Heat the frying oil in a large heavy pot (I recommend cast iron) to 360º, and preheat your oven to 200º. Combine the flour and chipotle in a small mixing bowl and mix well. Dust the zucchini with half of the flour mixture, toss with a fork and repeat with the remaining flour. Working in small batches, carefully drop the zucchini into the oil, waiting a few seconds in between. Fry the brats until they are golden brown. Remove to a wire rack inside a lipped sheet pan that's lined with several layers of paper towels. Keep the fries in the oven as you cook the remaining batches. Serve with Hidden Valley® Original Ranch® dressing for dipping. These dudes rock, John. That crispy crust reminds me of the deep fried asparagus that we do. Ironically, the typical dip is an avocado ranch dressing. Just take a recipe of Hidden Valley Ranch dressing with 1 half of avocado processed in a blender. Thanks, Chris! These are seriously crispy. It's ironic that you mention asparagus because I was eyeballing some at the store and thought that this would be a great treatment for them. I'll have give it a go one day. Sounds absolutely amazing. Chris (NibbleMeThis) mentioned you in an e-mail the other day and I'm glad he did. You have an awesome blog with some really great recipes that I can't wait to try.